On this day in fistiana, David Tua scored an exciting win over David Izonritei at Mohegan Sun Casino in the second half of an HBO Boxing After Dark Double Header. A Very Special Thanks for everyone playing KOFantasyBoxing and we hope you'll return to play in our next league that begins in mid-January. 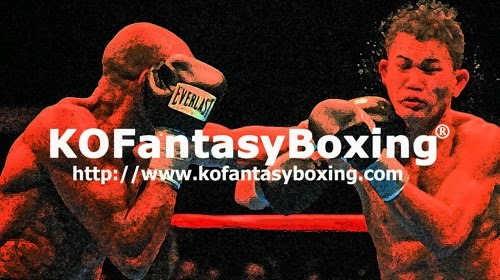 PLEASE NOTE: Residents of Arizona, Connecticut, Florida, Louisiana, Montana and Vermont may play KOFantasyBoxing® but are NOT eligible to win any prizes and the winnings will be given to the closest scoring eligible gym. International residents may also play KOFantasyBoxing® but they too are ineligible to win any prizes. of the week & much, much more! Fifteen years ago today Floyd Mayweather used blazing hand speed and accurate punching to make short work of challenger Angel Manfredy. Quick stoppages seemed to be the theme of the night on this card in Atlantic City as both the co-features were halted pre-maturely by the referee, although Tua-Rahman 1 was far more egregious than this one. Here, Manfredy was clearly stunned and soon to be stopped when the ref intervened. Fifteen years ago today David Tua and Hasim Rahman fought an exciting heavyweight contest with a very dissatisfying ending which ended Rahman's unbeaten streak and solidified one of the lesser heralded heavyweight rivalries of the nineties. Sixteen years ago today a featherweight war broke out at Madison Square Garden. It was a wild one while it lasted and is the greatest win of Hamed's career. Nine years ago today Andre Ward made his professional debut on the undercard of Johnson-Tarver 1 in Los Angeles, CA. Nine years ago today Antonio Tarver was upset by a supremely conditioned and motivated Glen Johnson at the Staples Center in LA. On this Day in Fistiana… 12/16/95 Tyson vs. Mathis Jr.
On this day in fistiana in 1995, Mike Tyson beat a Buster, but no, not that Buster, this was Buster Mathis Jr son of the former heavyweight contender and an opponent who was actually shorter than Iron Mike, the only time he ever faced a more diminutive foe. And quite frankly on this night, Mike's second fight out of the slammer, Tyson didn't look all that impressive, missing with both hands and getting winded before finishing Buster off with a couple short uppercuts in the 3rd. The whole card however was an impressive Don King marathon show, featuring ten fights including several stars of the era and of all time(see below). It was also offered on regular commercial television on a Saturday night on FOX after so many had been disappointed with Tyson's first fight after being released from prison, his 89 second bout versus Peter McNeeley in August of that year. The man Roy Jones Jr never faced, Michalzewski was the other 175 pound champ throughout much of Roy Jones Jr's Light Heavyweight reign. In this bout he faces Richard Hall and stops him in 11 rounds, a feat Roy Jones had accomplished a year and a half earlier. Voted Ring Magazine's "Most Fun Fight" of the year, Renaldo Snipes meets Lionel Washington at NYC's The Felt Forum. One of the weirdest fights in heavyweight history…redux. Twenty-eight years ago today a teenage heavyweight named Mike Tyson made his debut at Madison Square Garden, he wasn't there long. On this day in 2008 Manny Pacquiao surprised a lot of experts when he leapfrogged the 140 pound division and went up from beating David Diaz for a lightweight belt to challenging Oscar De La Hoya for the unofficial title of box-office darling, pay-per-view powerhouse. And if you listen to the commentary of Jim Lampley in the vieo below you'd think Manny split the atom and set the land speed record all in the little ring. Oscar really never has a chance, although he does land several body shots that made the 3rd and the 5th slightly more competitive than every other round in which Manny pelts Oscar with regularity. 38 years ago today the 25 year old John H. Stracey won the welterweight title in a bull ring in Mexico City. Rising from the deck in round one, Stracey set to work cutting and swelling up the champion's face in front of the hostile crowd. The great Jose Mantequilla Napoles was stopped in round six and never fought again, while Stracey became the first British Welterweight Champion in almost sixty years, since the reign of the great Ted Kid Lewis. On this day in fistiana, Fernando Vargas went to war against Felix Trinidad in a bout so brutal it fundamentally altered El Feroz' career. Some would go as far as to say Tito ruined Vargas in that 12 rounds at Mandalay Bay, just five days before the Californian turned 23 years old. Surviving two knockdowns in the opening round, the first times he'd ever been down as a pro, Fernando Vargas battled back, dropping Tito Trinidad in the 4th and grinding away in bone-thumping exchanges all the way to the end of the eleventh. Were Tito's low-blows purposeful in rounds 3, 4 and 7? Each seemed to come when Trinidad was hurt or at a decided disadvantage--in the third when it appeared his eye was roughed up by the seam on Vargas' glove. Although the fight was probably mathematically deadlocked after six or even seven there is no doubt the momentum had shifted in Trinidad's favor by the 8th and Vargas was getting the worst of most of the trading. Despite being out-gunned, on this day in boxing history, Vargas proved why he was, and is, so beloved by his fans as he willed himself on against the superior firepower of the Puerto Rican sensation. During the broadcast Jim Lampley quotes former Trinidad opponent David Reid's advice to Fernando Vargas and a warning about borderline tactics. "Trinidad will do anything to win the fight," said Reid. What do you think? Did Trinidad blast Vargas in the balls to survive in this fight? Does it detract from this, what may likely be Tito's signature victory? Do you think Vargas was ever the same after this fight? *12/2/14-The IBHOF class of 2015 will be announced in 2 days and Fernando Vargas may or may not be one of the inductees. He was the recent subject of a Blast From The Past and my gut says he'll get the call from Canastota this week.